What we like about the Mountain Buggy unirider is that parents control this ride-on toy for kids, while little ones get the feeling of independence. 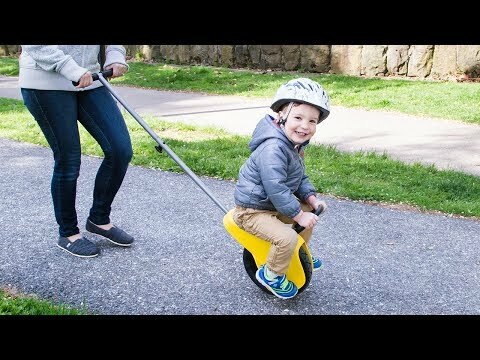 It’s the perfect in-between choice for young kids who are bored with the stroller, but aren’t quite ready for training wheels. Which is exactly why Mountain Buggy, in collaboration with Simon Lagham, created it. Simon's three-year-old son wanted more freedom, so he made a more fun (but parent-operated) alternative. The sleek design is easy to assemble, and the air-filled, rubber tire is durable to handle terrain ranging from the sidewalk to dirt paths or even grass. The seat positions kids directly over the tire, and there’s a hand grip and two foot positions for stability. Now a walk around the neighborhood feels like a bike-riding adventure, but with parents secretly in charge—and that will make everyone happy. Hello everyone! I'm Campbell Gower, chief cook and bottle washer for phil&teds and Mountain Buggy. I'm proud to introduce the unirider to The Grommet. 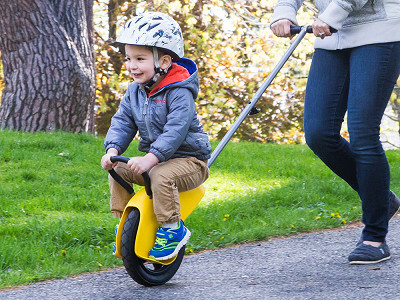 The unirider is a terrific bonding experience for parent and child. 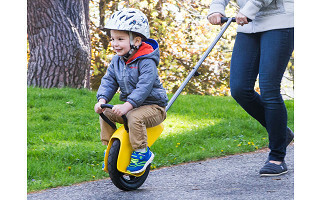 It’s a fun, all-terrain alternative for your little one when out and about; providing a sense of freedom for your growing toddler while still keeping them at your fingertips. With unirider, we embrace the challenge of creating products that help parents live their lives without limit. Looks neat. Do you find that they put their feet down off the foot rests? Guess it depends on the child. Hi Theresa, I think you're right. You could start slow to make sure they keep their feet up and of course, remind them to keep their feet up while they are riding. What is the recommended weight? @Elaine Hello Elaine! The maximum weight is 55lbs & we recommend use from 2 - 5 years of age. When you start depends completely on your comfort level as a parent. Thank you Elaine, I hope that answers your question. What we like about the Mountain Buggy unirider is that parents control this ride-on toy for kids, while little ones get the feeling of independence. It’s the perfect in-between choice for young kids who are bored with the stroller, but aren’t quite ready for training wheels. Which is exactly why Mountain Buggy, in collaboration with Simon Lagham, created it. Simon's three-year-old son wanted more freedom, so he made a more fun (but parent-operated) alternative. The sleek design is easy to assemble, and the air-filled, rubber tire is durable to handle terrain ranging from the sidewalk to dirt paths or even grass. The seat positions kids directly over the tire, and there’s a hand grip and two foot positions for stability.